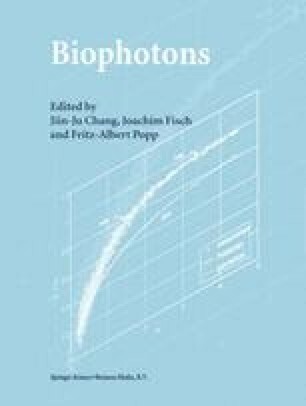 Theoretical work [1,2] and some experimental evidences[3,4] suggest that either spontaneous or photon-induced photon emission from biological system is at least partial coherent. This was verified by statistical distribution of photocounts measured in a short time interval such as 50 to several hundred milliseconds. It has been firmly established by quantum optics that the photons from a fully coherent field obeys Poissonian distribution, but the photons from a mono-mode chaotic field are subjected to geometrical distribution [5,6.] In the photocounts statistics experiment performed with conventional counting system, two experimental conditions must be met in order to obtain the real statistic distribution of the photon counts from the source under investigation. First, a stationary or a quasi-stationary photon field is required. However, this requirement is hardly satisfied in most circumstances due to the continuos metabolic changes in living system and slowly decayed fluorescence. Second, the noise of the counting equipment should be much lower than the net photon counts from living organism in order to prevent the measured photon counts statistics from distortion caused by the noise. This requirement is even more difficult to be fulfilled in the experimental study on living systems, since the spontaneous photon emission from living organisms, such as cell suspension and tissues, is rather weak and is often not one order of magnitude higher than noise. In order to overcome the above difficulties, a new coincidence counting method has been developed. The new system and the coincidence counting method can be used to determine the photon counts statistics of a non-stationary photon field with an ever wanted high accuracy.